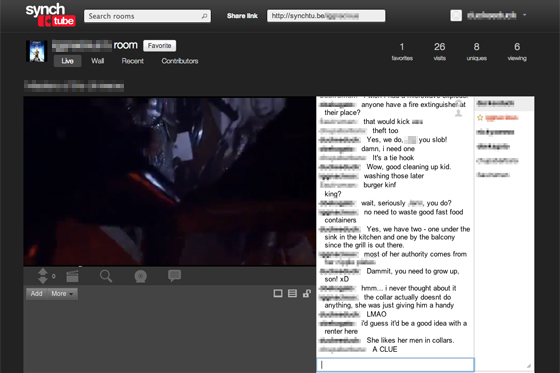 Tonight, a bunch of friends gathered on the interwebs to watch a movie, and for us to all hang out together in Cyberspace, we used a web program called synchtube. I started out by signing up for an account. It literally takes less than 30 seconds. 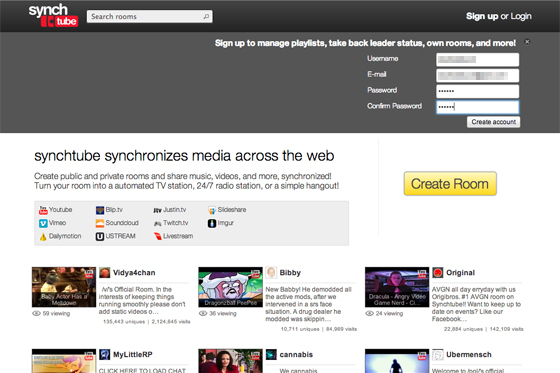 Right after signing up, you can “Create a Room” where you can search for videos and invite your friends to watch with you in the same “cyberspace” … get it? Eh?! 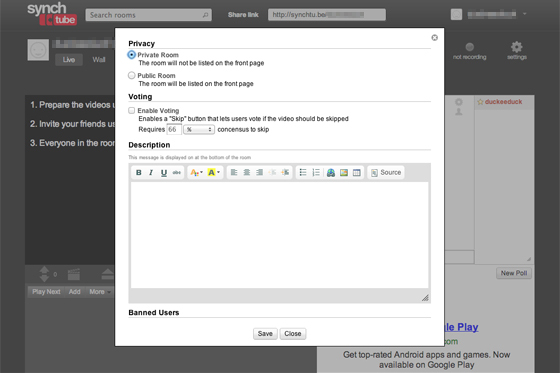 You can make your room public or private, and tweak other settings as well. Pretty cool! 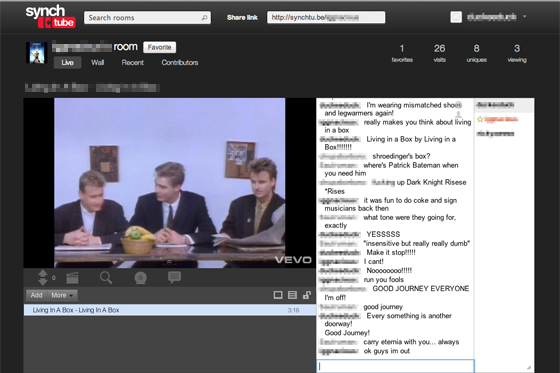 Our friend was hosting tonight’s “online movie night,” so we all joined him in his synch room. One of the cool things about this service is that it truly does synch everyone so that you’re all watching the same thing at the same time – no more, “Okay, are you guys ready? Hit ‘play’ on one, two … three! Oh shoot, who missed it? Fine! Try it again, one, two … wait, what do you mean there’s a phone delay? !” We all chimed in during the show, sometimes talking about the movie itself, sometimes taking off on tangents. But it was always hilarious when we all remarked on the same thing at the same time as we saw it on screen. After the movie, one of our friends who was watching searched for a music video from the soundtrack. He was then able to put it on the synch room screen so we could all watch it together. So great! This was super fun. 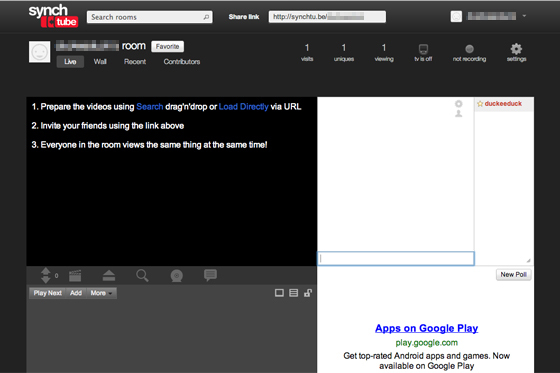 While we just watched videos that were on YouTube tonight, synchtube has the ability to stream from lots of different sites. There are so many cool uses for this free service. You can ask someone what they think of a video you just put together, watching it at the same time so you can explain certain things or they can ask questions in real time, you can show your friends a ridiculous video you’ve found and everyone can share their reactions to it … this is even a great way for families to share vacation slideshows, even if they’re all in different states! 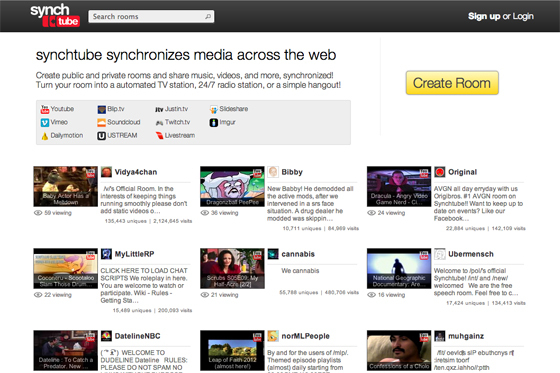 The next time you see a video online that you want to share, consider signing up for synchtube and sharing it, synchronized!